Daniels is set to unveil The Legends Of Cinema at the very successful Cinema Tower, located at 21-31 Widmer St. Film fever will reach a new high during this year’s Toronto International Film Festival, as The Daniels Corporation gets set to launch The Legends Of Cinema – an exclusive collection of suites available during this VIP Broker Sales Event. The timing for this introduction is perfect. The John Street area is literally exploding with change as it morphs into Toronto’s new cultural corridor. 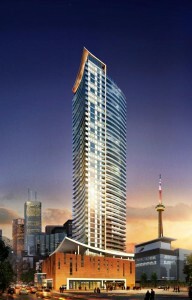 Daniels played a leading role in the transformation with the iconic TIFF Bell Lightbox and Festival Tower Condominium – the architectural headliner at King and John. Festival Tower is the most successful condominium in the Entertainment District, and is only steps from its sequel, Cinema Tower. Already under construction, Cinema Tower is a film-lover’s dream 365 days a year. Each purchase comes with a 3-year membership to TIFF Bell Lightbox, with exclusive perks and special privileges such as events held in Cinema Tower’s technologically advanced screening room and early access to tickets for TIFF Bell Lightbox events, including the Toronto International Film Festival, before they go on sale to the public. Owners at Festival Tower are enjoying a similar package and this has added tremendous value to their suites. Tying this condominium into the visual arts even more, Daniels commissioned artist Peter Powning to create a sculpture that will frame the residential lobby entry with a piece called “Strata.” Based on the idea of an exposed core sample of the earth, this sculptural metaphor calls to mind the historic warehouse character of the surrounding area. Cinema Tower will also feature a ground-floor performance space managed by the city’s cultural arts organization, ArtScape. This 43-storey glass-and-steel tower is rising from a six-storey podium on the southeast corner of Adelaide and Widmer Streets, and is designed by multi-award-winning Kirkor Architects and Planners to complement Festival Tower and TIFF Bell Lightbox. Suite owners will have access to a 12,000 square foot, 6th floor amenity space with a terrace, double-height multi-sport gymnasium with basketball court, steam room, hot tub and fully equipped exercise room. And how’s this for star treatment – an Amenities Coordinator will program the recreational spaces, and the condominium will feature a live-in Resident Services Director, 24-hour Concierge and retail space at street level that adds convenience to the excitement. Leading-edge thinking also led Daniels to construct Cinema Tower to the LEED® Certification standard. Sustainability is a critical component of responsible new home construction today, and Daniels feels strongly about respecting the environment. Residents at Cinema Tower will have access to a car share program, parking for bicycles, and the parking garage is future-proofed to accommodate parking for electric cars. Suite choices range from studios to two-bedroom designs, and Daniels offers some “combo suites” that can expand to three bedroom + study layouts. The modern interior finishes include, soaring 9 foot ceiling heights, hardwood flooring throughout, gourmet kitchens with Quartz countertops, handcrafted Irpina cabinetry and state-of-the-art Miele kitchen appliances– a rare find in condominiums today.